Reliability and performance are the pinnacles of the Peterbilt 579 model. This capable truck is innovatively designed with a lightweight body to maximize aerodynamics and efficiency. The reliability of the Peterbilt 579 model has made it a staple for years at our Allstate Peterbilt Group locations throughout the Midwest. The Peterbilt 579 model features a modern and ergonomic interior design for the perfect blend of comfort and easy-to-reach controls for the driver. The instrumentation panel has convenient gauges that are visible through the steering wheel so the driver has all the information needed while driving. Drivers can also maximize fuel efficiency with the engine-RPM sweet-spot indicator in the central display. Comfortable seats are a priority for all Peterbilt trucks, and the Peterbilt 579 model is no exception. The Peterbilt 579 standard seats provide good back support with a wide cushion and optimal foam density. There is the option to upgrade to the LX seats, which provide two-chamber lumbar support, adjustable side bolsters, suspension dampening, heating ventilation options, and swiveling capabilities. There is no shortage of storage on a Peterbilt 579 truck. This model comes with an abundance of storage in the side and rear walls, as well as liftable bunks. The Peterbilt 579 comes with oversized wardrobe closets and space for a mid-size refrigerator. There is a convenient pull-out workstation for drivers to work from too. All Peterbilt 579 trucks are equipped with LED lighting throughout for improved energy efficiency and performance. Peterbilt 579 units can be equipped with Peterbilt’s SmartNav™ system. This dual-function infotainment system includes a seven-inch touchscreen system to allow real-time vehicle monitoring, GPS navigation, phone and messaging, and satellite radio or smartphone listening. The SmartNav™ system has Bluetooth capability and voice recognition so drivers can operate the controls hands-free. The PACCAR MX-13 engine offers a variety of output options, ranging all the way up to a 500 horsepower and 1,850 pound-feet of torque rating. The PACCAR MX-11 engine can achieve an output of 430 horsepower and 1,550 pound-feet of torque. As the industry leader in fuel economy, the Cummins ISX15 achieves ratings from 400-600 horsepower with up to 2,050 pound-feet peak torque. The Cummins Westport ISX12-G engine has ratings of 320-400 horsepower and up to 1,450 pound-feet of torque. Both engines comply with all EPA and CARB emissions regulations. Four detachable sleeper sizes are available on the Peterbilt 579. Based on the desired level of comfort and weight, the Peterbilt 579 comes with 80”, 72”, 58”, or 44” sleeper options. The 80-inch sleeper was designed with driver amenities, vehicle quality, and fuel-efficiency in mind. Drivers have a comfortable sleeping environment with a 42” bunk so they can get back on the road fully rested. The 80” sleeper also includes convenient amenities like LED lighting, a refrigerator, shelves for a microwave, coffee maker, pantry drawers and cabinets, desk space, and a liftable bunk for additional storage and access to HVAC and audio components. A TV package, which includes brackets, power outlets, and shelving for a 22” flat panel TV and DVD player or video game console is also included. The 44” sleeper was introduced to the Peterbilt 579 model in 2013. It provides exceptional comfort with a 31” coil spring mattress while saving weight and reducing wheelbase requirements. LED dome and reading lights are included for quality illumination and power conservation. If you’re looking for a sleeper between these two options, check out the 72” or 58” sleeper on the Peterbilt 579. The 72” and 58” sleepers both come with comparable storage and amenities to the 80” sleeper, and the 72” includes enhanced comfort features like Auto Start/Stop technology on the Peterbilt SmartAir® No-Idle Sleeper Air Conditioning System. We know that fuel costs are always top of mind for both fleet managers and drivers. The Peterbilt 579 delivers exceptional fuel-efficiency for maximum MPG because of its aerodynamic design and powertrain optimization. The Peterbilt team is constantly finding new innovative ways to improve fuel economy through design. We’ve reduced drag with roof fairings and trim tabs that push air up and over the cab and trailer. Designed for improved aerodynamic performance, our sleeper extenders redirect airflow out and around the trailer with a 3” rubber flare. We’ve also found ways to reduce drag with contoured chassis fairings redirecting airflow around the rear tires and wheels. The Peterbilt 579 model can be ordered with the Bendix Wingman Advanced collision mitigation system as standard equipment. The enhanced safety features includes stationary object braking, lane-departure warnings, and speed sign recognition. All of our Peterbilt trucks including the 579 model come with innovative headlamp and windshield safety. After traveling to 10 countries for research and testing, our engineers have designed the best headlamps and fog lamps for visibility and coverage in the industry. Our one-piece windshield design makes driver visibility easier than ever. For a complete list, please visit our Peterbilt 579 Specs Sheet. 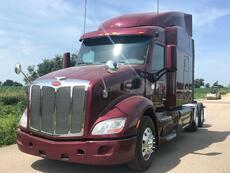 Interested in a Peterbilt 579?